Thanks for sharing this, John. I had not heard of him before. There is a wonderful picture of him on the Wikipedia and a couple of his paintings. I rather like his style. 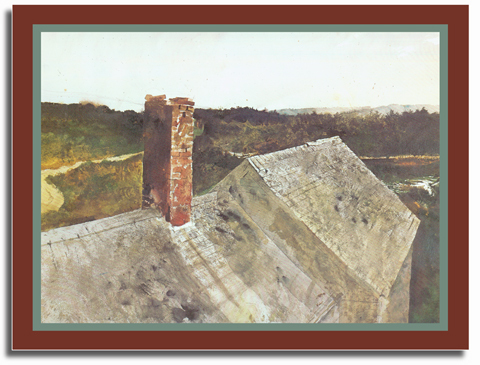 I was always amazed that when Wyeth began his artistic career Abstract Expressionism was all the rage. He had his own vision and stuck with it throughout his lifetime. There is much more than technique and realism going on in his work. There is psychological meaning and mystery. He seemed to be a man who really enjoyed his life and especially his work-that is inspiring. I, too, have been a lifelong admirer of Andrew Wyeth and his work. Knowing there will never be another Wyeth painting makes me sad. May he rest in peace. It is interesting to read about your sources of inspiration! I thought that the late Mr. Wyeth was on a par with American artist, Edward Hopper (the painter who did the moody "Nighthawks", presently on display in the Chicago Art Institute). If anything, I thought Mr. Wyeth's technique was more polished than Mr. Hopper's while his subjects were just as evocative. This page contains a single entry from the blog posted on January 16, 2009 2:03 PM. The next post in this blog is Obama's World.